Fully Automatic, Auto noise cancel, Auto ground balance, Auto sensitivity, (2 detect modes) Deep all metal and gold (iron reject). 24 bit processor 45 kHz VLF detector. 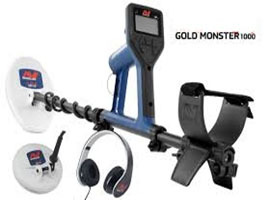 Includes 2 coils 10″ x 6″ double”D” and round “D” with coil covers, Headphones, Rechargable li-lon battery, AA batery carrier, AC charger, Headphones, digging tool.